Cocoa Boutique is a new chocolate club offering a monthly selection of artisan chocolates delivered by post. 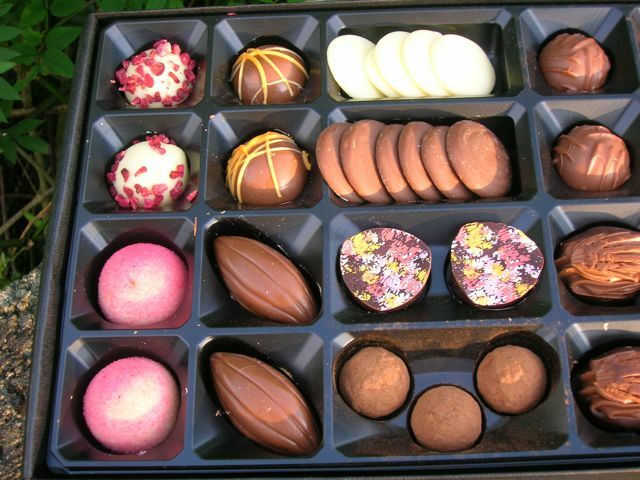 Each month a different selection is offered from a range of chocolatiers who are located in Britain and further afield. The boxes are sturdy and well finished with an elegant appearance. They are designed to fit through standard letterboxes, so need to return home to a delivery note when you’re tired and hungry. The boxes come with a description of each chocolate and a scoring card which you can use for feedback. The selection I received for review contained chocolates from chocolatiers Barry Coleno, Pierre Ledent and Claire Hicklin. It was a good mix of dark, milk and white chocolates. There was plenty of contrast: from rich dark chocolate brandy truffles and strong dark chocolate coffee beans to creamy white chocolate buttons and pink champagne truffles. There were two of each chocolate, which theoretically makes it easier to share, although CT might disagree. In addition to these, there were also a handful of white, milk & dark buttons, some coffee beans and some chocolate covered honeycomb pieces. If you like your chocolates teetotal, look elsewhere – there was plenty of alcohol sloshing around in the form of champagne, cassis, rum, brandy and Irish cream; the warming effect from these was welcome as the rain continued to lash down. As a general observation CT and I enjoyed most of these chocolates and found them to be rich, flavourful and not too sweet. The selection was interesting with a good range of fillings, textures, flavours and types of chocolate. Note to CT, I’d be happy to receive one of these on a monthly basis – assuming you think I’m worth £19.95 a month! Milk Chocolate Almond Praline – the combination of roasted salty pralined crunchy almonds covered in milk chocolate was as good as it sounds, if not better. Cocoa Dusted Dark Chocolate Salted Caramels – need I say more! Raspberry with a Hint of Orange – raspberry and chocolate is one of my favourite flavour combinations. This one was particularly interesting as the hint of orange brought out the raspberry flavour without overpowering it. Milk Chocolate Honeycomb – small pieces of honeycomb covered in chocolate gave a good ratio of chocolate to sweet, sticky honeycomb. Others were the interestingly named Pamela, which was an unusual combination of pear and cassis ganache; a milk chocolate truffle which tasted alcoholic, although this wasn’t mentioned in the description; a white strawberry cream which had lovely light mousy texture but was slightly too sweet for me; a pink champagne truffle the flavour of which hit almost before touching our tongues. It was rich and sweet. Coffee flavour not being one of my favourites, I left these for CT to try. He enjoyed the Vanilla Irish Cream, found the Rum Cafe Cream pleasant but lacking a distinctive coffee note. Not everything was to his liking, however: the coffee beans had an overly strong smoky and burnt flavour possibly due to over roasting. I tried one and had to agree. If you’d like a chance of becoming a “taster” for Cocoa Boutique and getting a box of chocolates every month, they are currently running a competition to pick 25 tasters. And if you’d like to get an introductory box to try for only £9.95, then click here. This is the kind of chocolate box which I would share with my husband after kids’ bedtime. Nice review about quality chocolates. Great review – and interesting to see what you thought of them too. I really enjoyed the chocolate covered coffee beans but the salted caramel ones were my favourites. Ha ha – no pressure CT! I’ve got a box of these and they look so nice, I’ve been saving them for special. I really should crack on and get them reviewed seeing as they’ve been kind enough to send them me. Your positive review only heightens the dilemma of when to eat them. A great review of fine chocolate. Couldn’t afford these chocs but nice for a present!